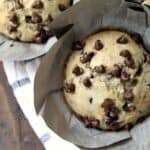 Chocolate Chip Banana Bread Muffins, easy, moist, from scratch muffins that are the best snack, breakfast, or even dessert! Learn how to make muffins that everyone will rave about! Chocolate Chip Banana Bread Muffins, this easy from scratch muffin recipe results in the best moist muffins! 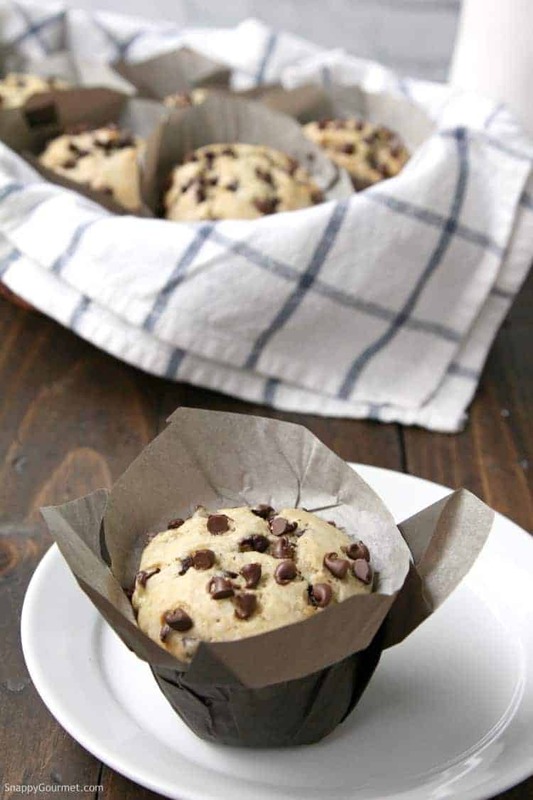 These banana muffins are loaded with chocolate chips and great for breakfast, snack, or dessert. 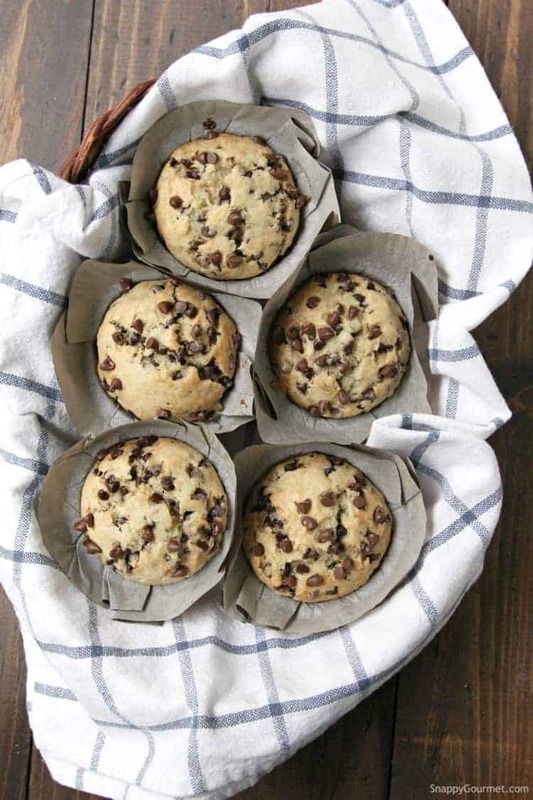 I love banana and chocolate together like my recent Chocolate Chip Banana Bread and Banana Oatmeal Cookies with Chocolate Chips and Walnuts, so now I’m adding these muffins to the list. We loved these banana muffins SO much! They’d even be good warm out of the oven with a little ice cream on top. Totally normal, right? These muffins come together fast, and are really easy to make! You basically mix together the “dry” ingredients in one bowl, “wet” ingredients in another, then combine and stir in the chocolate chips. So for the dry ingredients, whisk together the flour, baking powder, baking soda, and salt in a mixing bowl; then set aside. For the wet ingredients, whisk together the vegetable oil and granulated sugar. Then whisk in the mashed banana, egg, vanilla, and milk. You’ll need about 1 cup of mashed banana for these muffins which is about 2-3 small bananas. Make sure your bananas are ripe, not overripe and not under ripe for best results. Mix the dry ingredients into the wet ingredients until almost combined. Stir in the chocolate chips and mix again until JUST combined. Be careful not to overmix. You might want to reserve a few tablespoons of chocolate chips to put on TOP of the muffins before baking, but personal choice. You could substitute some chopped nuts (such as walnuts or pecans) instead of the chocolate chips if you’d like. Toffee chips would also be great, as would any of your favorite baking chips such as dark chocolate, peanut butter, etc. 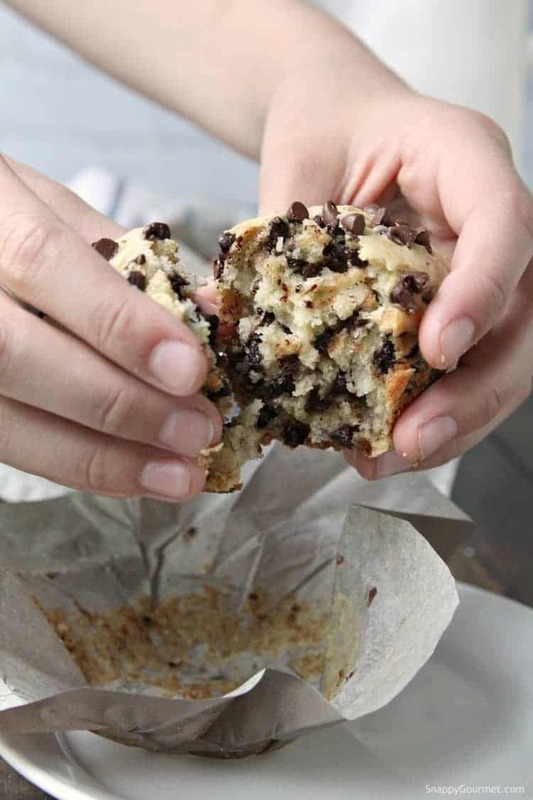 Scoop the muffin batter into paper liners. Ice cream scoops work great for this! For paper liners, I like these tulip bakery style paper liners but you can use whatever you’d like. If you reserved some of the chocolate chips, you can sprinkle the chips on top of the batter before baking. You can also sprinkle a little sparkling sugar or granulated sugar on top if you’d like, or even a crumb topping for muffins. 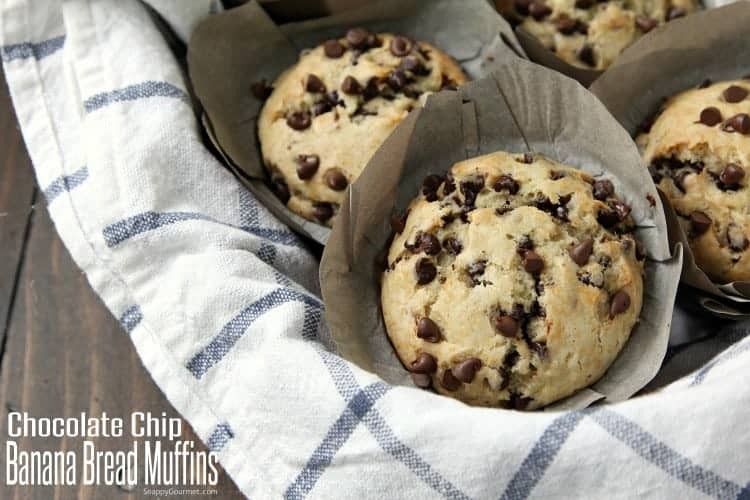 I used a regular size muffin pan with the paper liners, but you could bake this muffin batter in a mini muffin pan, muffin top pan, or a silicone muffin pan. The yield and baking time may vary though based on what type of muffin pan and/or what type of paper liners you use. Bake the muffins until they are golden brown around the edges. Again, depending on your pan and/or size of your paper liners, baking time may vary. For these liners and about 12 muffins, it should take about 20-25 minutes. 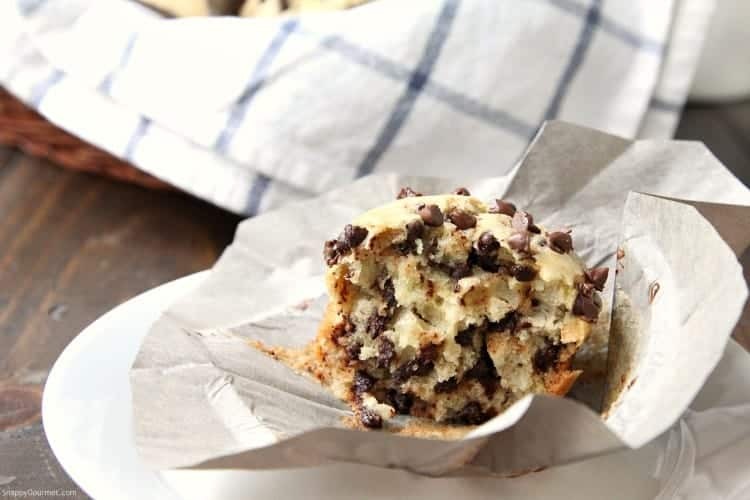 There are A LOT of chocolate chips in these muffins which I love, but if you’re not so sure about all that chocolate, start with half a bag, then add a little more at a time to your batter until you think you have the right amount for you. Would love to hear what “add-ins” you put in these muffins! Hope you enjoy these Chocolate Chip Banana Bread Muffins as much as we all did! Serve these with your other favorite breakfast recipes like my authentic Beligian waffle recipe. Chocolate Chip Banana Bread Muffins, easy from scratch banana muffins! Moist and delicious! Whisk together flour, baking powder, baking soda, and salt in medium mixing bowl; set aside. Whisk together oil and sugar together in a large mixing bowl. Whisk in banana, egg, vanilla, then milk until well combined. Mix dry ingredients into the oil and sugar mixture until almost combined. Reserve about 1/4 cup of the chocolate chips, then mix in remaining chocolate chips into batter. Scoop batter evenly into paper-lined pan filling cups about 2/3 full. Sprinkle reserved chocolate chips on top of batter. Bake muffins at 350 degrees F for about 20-25 minutes or until golden brown around the edges. Cool slightly, then remove from pan and cool on a wire rack. SNAPPY TIPS: You can use different size pans and/or paper liners but yield and baking time will vary. SNAPPY SUBSTITUTIONS: Instead of all or some of the chocolate chips, you can substitute chopped nuts, toffee chips, or other baking chips. It looks so moist and I love it! Wow, love how these are loaded with chocolate chips. I wouldn’t change a thing. They’re perfect! These look like they came from a fancy bakery. I love the combo of chocolate and banana together too! 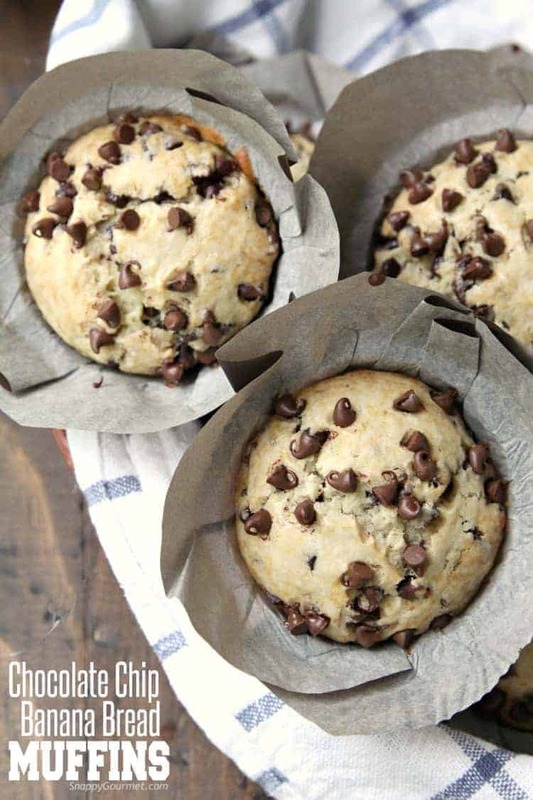 I love chocolate chip banana bread, but what a great idea to put it in to muffins. Much easier for kids to hold. Yum. One of my all-time fave flavor combinations in muffin form! Pinning for breakfast. Oh, I love these! 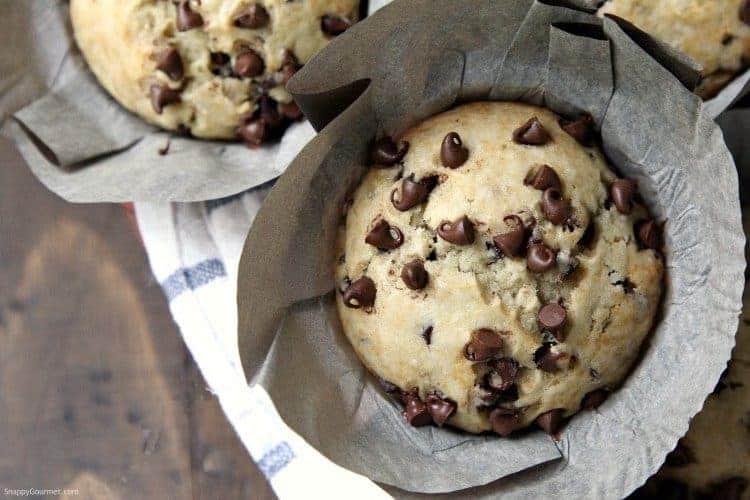 The fact that these muffins are packed with chocolate chips make me wanna try them even more. Muffins are mind blowing and the presentation is adorable. Now, this recipe will be one of my favorites. Looks beautiful and tasty! Cannot wait to try this. This recipe looks incredible! Thank you.